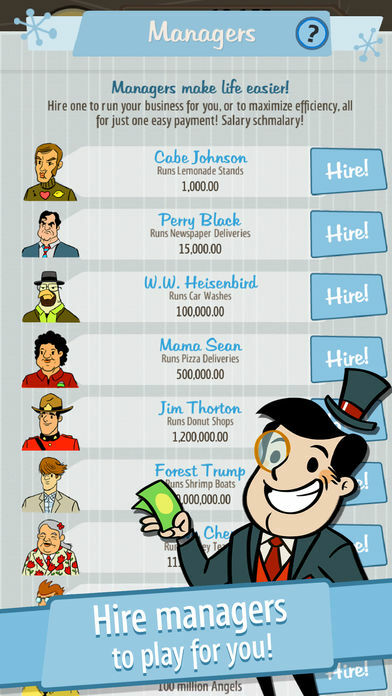 Home #LOL AdVenture Capitalist – Making Money Is Easy! 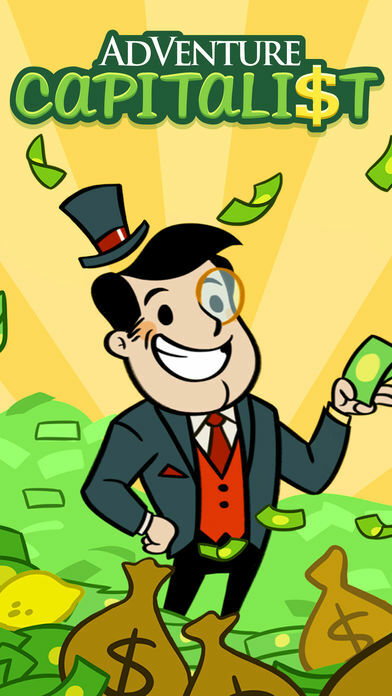 AdVenture Capitalist – Making Money Is Easy! AdVenture Capitalist (by Kongregate and Hyper Hippo Games) is as far as we know, the prequel to the equally awful game AdVenture Communist. Centered around making as much money as possible, your mission in this game is to build a Capitalist empire starting with a small lemonade stand. Just like AdVenture Communist wasn’t exactly a clicker game, AdVenture Capitalist isn’t exactly a clicker game either. Although you are required to start out squeezing lemons, delivering newspapers, and washing cars on your own, the aim of the game is to build up an empire that automatically makes money for you, rather than actually doing any work yourself. 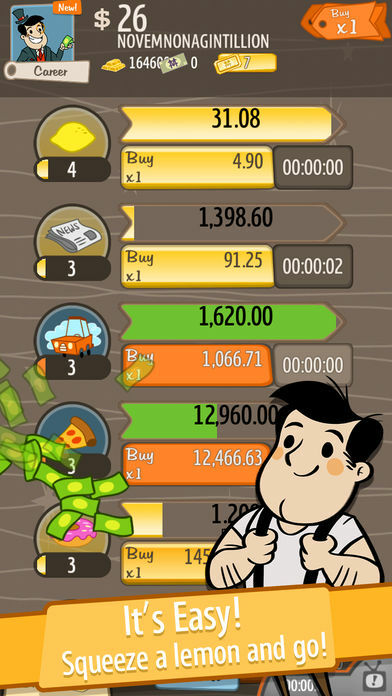 Once you’ve tapped on the screen of your device several hundred times and hired your very first worker, AdVenture Capitalist transforms into a management game centered around maximizing your profits by carefully deciding when and where to spend your money. 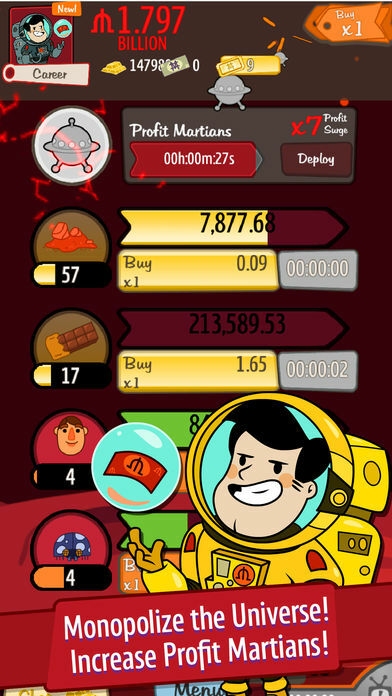 In case you were wondering the game continues to make money for you even while the app is closed, meaning you can play this game on and off for 5 minutes every day and still become a total billionaire! Although this isn’t exactly a bad thing, for anyone who has played AdVenture Communist (or our favorite We Are Illuminati ) recently, the graphics and to a degree even the gameplay system used in AdVenture Capitalist feel a little dated. Much as this isn’t going to be an issue for anyone wanting to give this game a try if you’re after something new, we recommend you check out one of the two clicker games listed above. 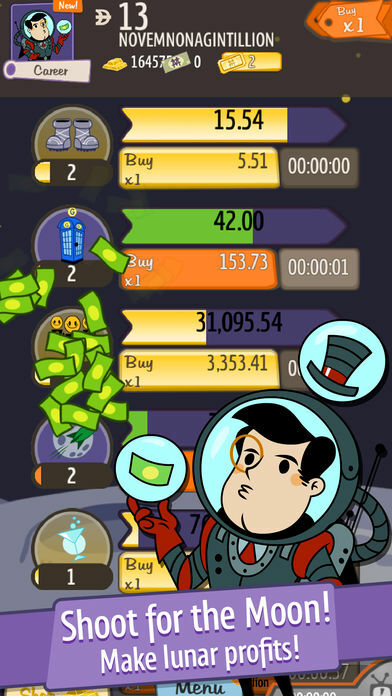 Last but not least, AdVenture Capitalist is one of the few clicker games that isn’t littered with Ads! Although there definitely are Ads, you won’t be forced to watch an Ad every single time you want to upgrade something. If you believe capitalism is the way of the future this is the game for you! …the only thing is, as far as we are aware, this game was released before AdVenture Communist…?